Hiroshima’s Brad Eldred has seen Shohei before. It’s hard to tell sometimes where one story stops and another starts, and so it’s been for Shohei Ohtani. A tall hard-throwing rookie pitcher with batting-practice power, Ohtani was perhaps the biggest question mark of the year. Major leaguers wondered whether he could succeed at both pitching and hitting. If he could, would he be able to keep it up, playing in a much-more competitive environment than he was used to? The things people said about Ohtani this spring as a 23-year-old with the Los Angeles Angels are the same things said five years ago about him as an 18-year-old with the Nippon Ham Fighters. Hiroshima’s Brad Eldred was on hand at Mazda Stadium, when Japan watched as the two-way rookie batted and pitched in a game for the first time as a pro. “I witnessed his draft and all the hype. There haven’t been that many players who’ve been as popular. I remember I saw him the day before going to the gym and I thought, ‘That’s a big guy,’” Eldred said. Casey McGehee, now with the Yomiuri Giants, was the first player in NPB to bat against Ohtani in a game, a preseason contest between the Fighters and Rakuten Eagles at Tokyo Dome. McGehee struck out on a slider after seeing a 151 kilometer-per -hour (93.8 mile-per-hour) fastball, but Ohtani was just getting warmed up, he hit 157 kph (97.6 mph) and sat at 156 kph (96.9 mph). Brandon Laird has had a three-year, front-row seat for the Ohtani show. 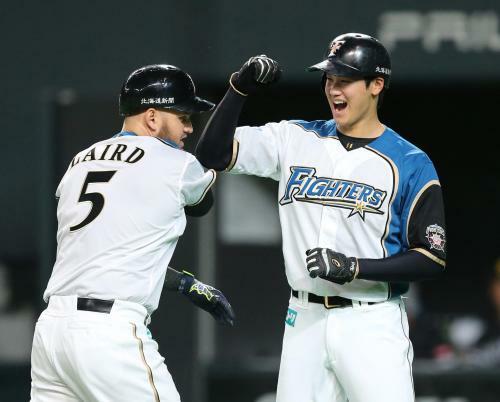 Third baseman Brandon Laird joined the Nippon Ham Fighters in 2015, Ohtani’s third spring as a pro. 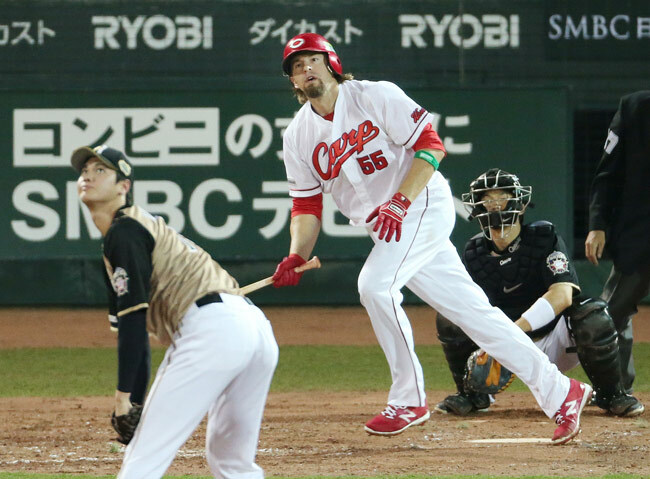 McGehee returned to Japan last year for the first time since 2013, and was stunned by Ohtani’s batting progress despite only being a part-time designated hitter. After watching Ohtani up close for five years, Japan’s foreign players watched as big leaguers said over the winter they couldn’t conceive of a player actually doing both. When Ohtani failed to impress this March, panic buttons were being pushed, and Hiroshima pitcher Jay Jackson was asked by friends what was wrong with Ohtani. The speed of Ohtani’s adjustments against both major league hitters and pitchers has been closely watched by former major leaguers playing in Japan. Ohtani’s choice of the unheralded Angels may have surprised America, but drew applause here. “There are probably a bunch of places that are just as good, but I know a number of the guys on the Angels pretty well, and he couldn’t have walked into a better group of baseball guys,” McGehee said. “When you’re talking to them, they genuinely like him and genuinely want him to do well at both. Jackson, who also knows Angels players, said much the same. Once the season started, Ohtani exploded onto the scene, setting up a high profile May 27 matchup against New York Yankees ace Masahiro Tanaka. As a rookie, Ohtani batted against that year’s Pacific League MVP 11 times, was hitless with six strikeouts. Despite five years additional experience against pro pitchers, Ohtani managed just a walk at Yankee Stadium. After the game, Tanaka said Ohtani was just another important out, but McGehee wasn’t buying it. It’s treatment Ohtani will have to get used to in the majors, although perhaps without the intensity Tanaka brings. 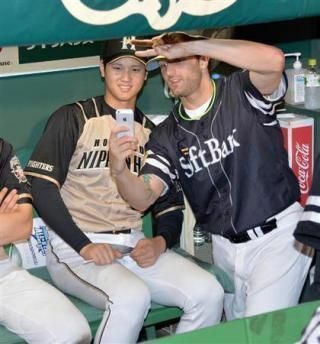 Shohei Ohtani shares a moment with Dennis Sarfate. Over the winter, Sarfate said pitchers need to start Ohtani with hard pitches inside and get him to chase low pitches away. At the start of the season, however, Ohtani was ready for that tactic. He would back off the plate and open up in order to hammer inside fastballs. The watershed moment was homering off a 97-mph Luis Severino inside fastball. Since then, pitchers have stopped pitching Ohtani inside so much. Sarfate said the second half is going to bring an issue Ohtani is not accustomed too, fast bats in the hot summer months. The data over the past four seasons from America and Japan indicates Japanese baseball slows down more after June than in the majors. Two speed indicators — the percentage of triples per plate appearance and the stolen base success rates — drop much more in Nippon Professional Baseball. And though Ohtani was a solid second-half hitter in NPB, his 2.80 ERA from the start of July was over half a run higher than it was through June (2.25). Since 2013, ERAs across NPB rose by 1 percent from July 1. Ohtani’s increased by 25 percent. Everyone, even those who believe Ohtani should focus on either pitching or hitting, is pulling for him to succeed in his dual role. For years, players and scouts doubted whether any club would actually let Ohtani bat full time. Now Japan’s foreign players are thrilled the Angels are letting him continue down his unusual path. Laird, who believes Ohtani is a future major league ace pitcher, still wants to see what he could do as a full-time hitter. Sarfate, goes further. He believes the batter’s box is Ohtani’s natural habitat. Although Sarfate believes it is impossible to continue doing both, he too is entranced by Ohtani’s quest, following every game closely as he rehabs from hip surgery in Arizona. It’s a story – whether at its beginning, its end, or somewhere in between – that never gets old.